“So! Your’e still buying discs?” Uh, yeah actually. “You must be some kind of retro format loving hipster… I bet you still go and buy cassette tapes.” Hey! No need to get mean man! Owning a laserdisc player does not make me a hipster. Despite the ribbing, I will confess that I still love physical media. But why? Ultimately it boils down to bandwidth, quality, and ownership. So, lets take a little closer look in to all of this, and what my plans are for the future. First, America has a long way to go when it comes to the internet backbone of our country. According to a “State of the Internet” report recently put out by content delivery network Akamai, U.S. service is becoming even slower when compared to the rest of the world. The U.S. now has the ninth-fastest average Internet connection speed in the world, behind South Korea, Japan, Hong Kong, Switzerland, the Netherlands, Latvia, the Czech Republic and Sweden. Head up north to my in-laws house in rural Minnesota, and you will find the highest speed available for purchase is 2 mbps down, at a cost of over $70 dollars a month (land based wireless by the way). However, given his budget, he is relegated to federally subsidized two way Satellite; which is plagued by abysmally slow upload, lag, and a 250 mb per day bandwidth cap. Many people are not aware how limiting your internet options become once you leave the city. I would love to know what the economic impact is on these rural areas, because I would bet all my gear on it being substantial. I can tell you as a matter of fact, that my father in-law will most likely never stream a movie in that house as long as he is alive. He will likely be forced to buy discs for at least a decade or more. It is tough to see, but my father in-law resides squarely in the tan area. Despite this, streaming does work on modest network connections. I admit that I stream a vast number of television shows over Amazon Prime to my 42 inch plasma. They look fine at that picture size, and at my nine foot viewing distance I find myself quite happy with it. However, once the same stream is shown on my projector at 100 inches, you begin to notice the video artifacts that accompany the compression and the inherent limits of the resolution. Unfortunately, I don’t have the bandwidth to stream 1080p resolution content at my current location, but I would be eager to compare it to Blu-Ray someday. Other experts on the interweb have compared them, and noted that Blu-Ray still has the edge over any current streaming system when it comes to picture quality due to the greater bandwidth being output and less compression used on discs. I would tend to believe them. So why “stream” anything? Why not have a locally stored movie file similar to what most folks do with their Mp3 music collection? Truth is, movie and media servers are becoming more popular, and it seems like Hollywood hates them, in favor of the cloud. The main hang up is digital rights management (a subject that gets far too complex to fully cover in this post). For nearly eight years, a popular server company called Kaleidescape became embroiled in a lawsuit with the DVD Copy Control Asscoitation over the legality of the entire system. Now if you purchase a DVD, ripping, and storing a copy for yourself does not actually violate copyright (sharing it does). Copyright violation however, is not what the DVD CCA argued in court, instead they alleged that the system of ripping or decrypting the DVD during the process of storing it to the hard drive violated it’s CSS (content scramble system license). Essentially saying that decrypting it for storage is in breech of the terms of service of the disc. The result is that for every Blu-Ray that you put on your Kaleidescape server, you have to keep the disc in a special carousel changer for verification of posession of the disc. Once verified, it still plays the movie off of the hardrive, so what is the point? I don’t know, Stupid! Other server manufacturers such as Mozaex, seem to have side stepped around the ruling by storing the file on the server in its original encrypted file format and only “decrypting” it upon play back, like a Blu-Ray player would. Sneaky. 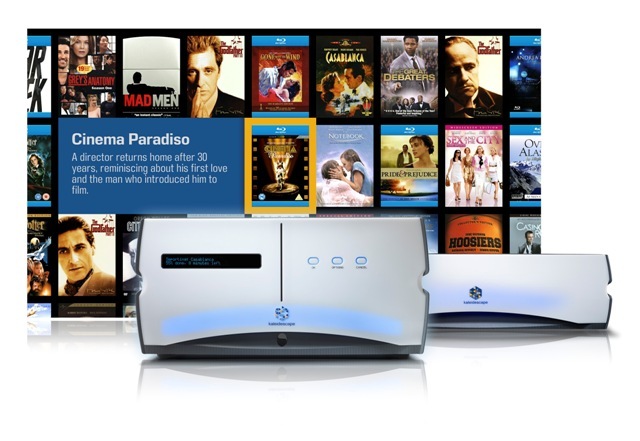 Kaleidescape Media server and disc carousel. The irony of the Kaleidescape ruling is that now Kaleidescape is the only company in the industries good graces, who has been granted the ability to allow you to buy a full legal Blu-Ray download from their proprietary store which can be stored on their server for playback. I guess there are some benefits from taking it in the chin first. To be honest this is what I wish Apple TV was like. My movie isn’t on the cloud, it is on my hard drive, in my home, not subject to compression, or the speed of some crummy cable coming up the road. While the ability to purchase a Blu-Ray download is neat, the requirement of having a separate carousel to verify all my other disc-based movies is lame. The other problem is that they start around $4 grand (which is a good deal apparently, as they used to cost around $25 grand)! So, what does any good nerd do when he see’s a piece of yummy, yet flawed tech that he likes and is out of grasp? He builds his own…. So, Kaleidescape “movie juke box” alternatives will be my next post. Stay tuned.